When it was released in 2012, Wreck-It Ralph hit theatergoers over the head with its incredible animation, video game call backs and moving story. Its success made a sequel inevitable, and Ralph Breaks the Internet picks up where the original film left off. Ralph (John C. Reilly) has come to terms with playing the villain in his “home” videogame, Fix-It Felix Jr., during the day, in large part because he gets to spend time with his best friend, Vanellope (Sarah Silverman), during their off-hours. Their lives together are routine, which is just how Ralph likes it. As the title suggests, and as sequels tend to do, Ralph Breaks the Internet greatly expands the Wreck-It Ralph universe even as it further develops the tensions inherent in the relationship status quo present when the film begins. Wreck-It Ralph existed in a self-contained bubble—a villain longed to be a hero. A glitch longed to be fixed. Together, they help one another understand the beauty within and save one another. Ralph Breaks the Internet bursts out of those confines and escapes to the larger stage of the internet. 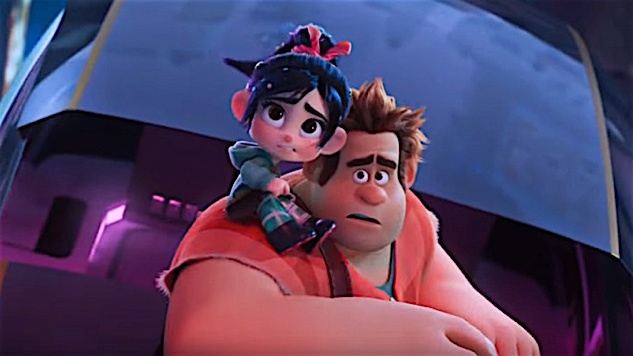 But ultimately, much like the original, Ralph Breaks the Internet delivers it strongest punches when it’s focused on the evolution of Ralph and Vanellope’s relationship. It’s clear pretty much from the start that their relationship has become toxic. Ralph, well-meaning as he may be, has formed an unhealthy attachment to his best friend. He longs to go everywhere with her. Vanellope doesn’t have a moment to herself. Without consulting her, he’s decided their lives are fixed in a pattern and shouldn’t change. Ralph Breaks the Internet explores this codependent relationship in an easily digestible way. The audience loves Ralph after his struggles in the first film. He literally wears his cookie heart around his neck. So when he yells at Vanellope for wanting a different life, viewers know he’s not cruel, but that he is hurting. As we as a society continue to define toxic masculinity and what abuse looks like, Ralph Breaks the Internet feels like a timely introduction to the topic for children. Those identifying with Ralph’s feelings of being left behind can begin to process their emotions through Ralph’s return to the arcade. The children who dream of a life beyond their suburban town, can learn how to express that desire in a healthy way. Whether one enjoys Ralph Breaks the Internet more than Wreck-It Ralph may depend on one’s connection with the arcade culture that defined the first film. Old school video games are a niche market with a limited purview. The smells and sounds of an arcade are tangible. Nearly everyone has picked up a controller or sat in an arcade and tried to beat a stranger’s top score. Nonetheless, Ralph Breaks the Internet provides a fun, family-friendly time at the movies. It may lack the nostalgia-fueled power of the original, but it has a potent power source of its own in the messages it conveys. Instead of being just another manifestation of the “girl power/you can be anything” trope, it populates the screen with women in powerful positions—as an actual CEO, as the leader of a dope car crew, and as a little girl trying to find her place in the world. It’s a reminder that girl power exists naturally; it does not need to be forced. That’s a message worth building a franchise around.